Stir together milk, yeast and 1 teaspoon sugar in the bowl of a stand mixer; allow to sit 10 minutes or until bubbly. Using the dough hook, mix in remaining 1/4 cup sugar, 1 egg, butter, baking powder, salt, cinnamon and allspice until well combined. Mix in flour and raisins on low speed until combined. Increase mixer speed to medium and allow to knead for 8 minutes, or until smooth and elastic. Place dough in large greased mixing bowl and lightly cover with plastic wrap. Allow to rise in a warm area for 1 hour or until doubled in bulk. Divide dough into 12 equal pieces and form balls. Place on two greased cookie sheets. Lightly cover with a towel and allow to rise for 30 minutes in a warm area. 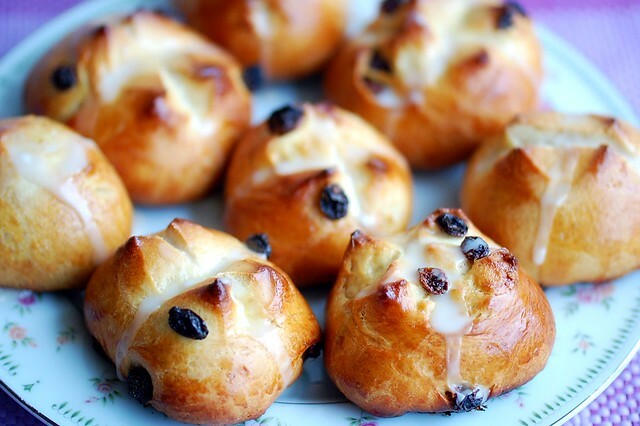 Using a shap knife or scissors, cut a cross into each dough ball. Whisk remaining 1 egg with a teaspoon of water until well combined; brush over dough balls. Bake 15 minutes or until golden brown. Transfer buns to wire racks to cool completely. To make the glaze, in a small bowl, whisk together confectioners' sugar, vanilla extract and 2 teaspoons of water until well combined. 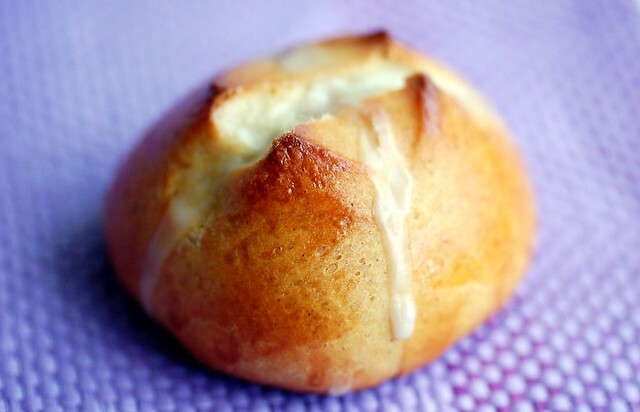 Drizzle glaze into a cross over the tops of buns. Makes 1 dozen hot cross buns. 25 comments on "Hot Cross Buns"
I could stare at your hot cross buns forever and eat them even longer than that. Regarding the dessert, I'd totally vote for the strawberry lemon trifle. I hope you have an awesome Easter with your family. These look really delicious! Those buns of yours are lookin' good. Oh they are really beautiful!!! So sweet and shining icing yum! I like Easter too, especially all the chocolate around it! 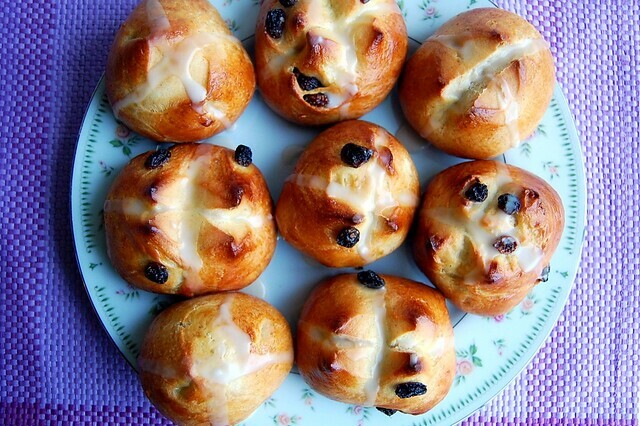 These look delicious...seriously some of the most gorgeous hot cross buns we've seen! I say carrot cake whoopie pies! Those sound pretty tasty! I'm debating doing a raw carrot cake/cheesecake deal myself, but I don't think I have the time. I've gotta make a vegan dish for myself to chow on. Have a fun Easter! I hope you get your ham! I'm pretty sure my family doesn't eat ham on easter either...I'm pretty sure they eat pasta. And only pasta. Hard to say though...all the holidays are running together in my mind. I vote for the carrot cake or the carrot cake whoopie pies! Anything that has cream cheese frosting is ideal in my opinion. 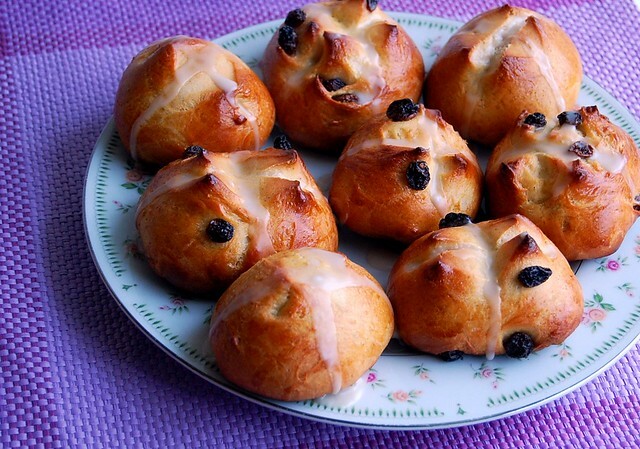 These hot cross buns are adorable! And I bet, absolutely delicious as well! You have a great way with lighting in those pictures of the buns, nice work! 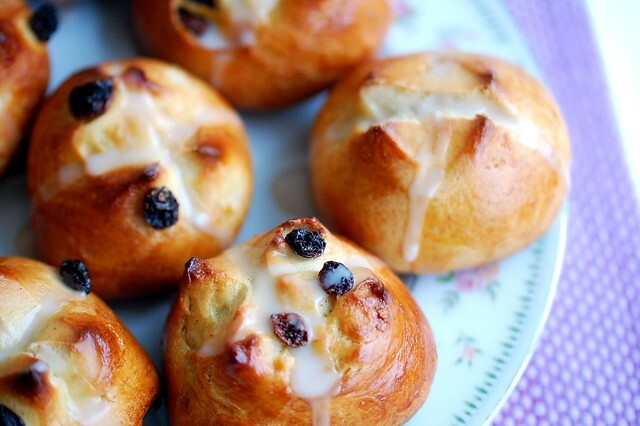 I don't think I have ever had a hot cross bun, but they look like a perfect addition to brunch! I haven't had hot crossed buns since I was a kid! Those look really good! I always end up making "half and half" recipes because I love nuts and dried fruit and my boyfriend does not. I would make carrot cake, it's easy to make and very tasty too. (I know you always come up with your own fantastic recipes, but the Pioneer Woman's carrot cake is awesome!) Have a happy easter! hot cross buns! how cute! I love hummingbird cake...it is so good! Have a great Easter and I'm looking forward to reading some stories about your grandma and Elmer!!! Hot cross buns are a must around here for Easter. Those are LOVELY! They look like something from Alice in Wonderland, just little bits of perfection. 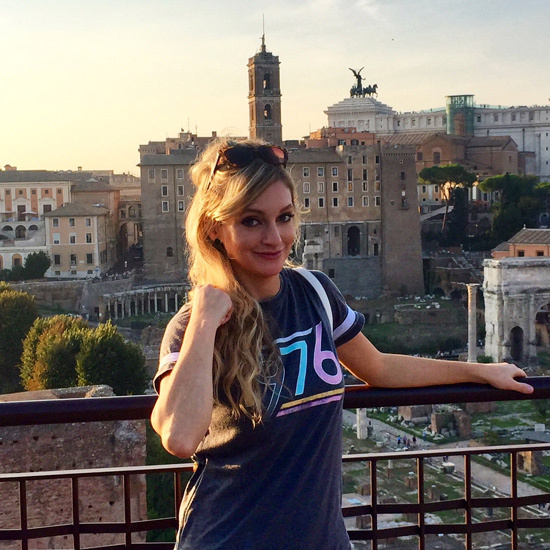 unbelievably gorgeous and delicious and all the above! i want one NOW please! Hope to make these soon maybe with a different kind of glaze like blackberry or something? I thought I'd be the only one so far to let you know how I say Reece's. Resez! i love the unique little pointies on your buns! I had hot cross buns this year for the first time. A friend made them and brought them around to everyone so we could bake them fresh in our homes. I really liked them!